Make the most of your month with our list of 15 favorite events and happenings in Houston during October 2018. We’ve reached the season of Halloween, pumpkin spice, cooler weather, and autumnal hues. And with plenty of events happening in and around Houston, you’ll have good reason to get out and experience all of the fall events that our city has to offer. Up your fashion game by spotting new styles at the annual Fashion X Houston event; get spooked at a haunted house or Halloween-themed party; cheer on the Rockets in their season opener against New Orleans; make your way to the Orange Show Gala and raise funds for Houston’s iconic folk sites; browse the works of more than 300 artists from across the country and more at these can’t-miss events in Houston this October. Events are not ranked, but are listed in chronological order throughout the month of October. Oktoberfest Events Around Houston | Through Sunday, October 21 – Clink pints at one of several German beer festivals in Houston, including King’s Oktoberfest (both in Pearland and in the Heights), Karbachtoberfest, and Oktoberfest at Saint Arnold Brewery. Prices, times, and locations vary. The Catastrophic Theatre presents Sam Shepard’s Curse of the Starving Class at MATCH | Through Sunday, October 21 – See the opening performance of Catastrophic Theatre’s 2018 to 2019 season as they present Curse of the Starving Class, a harrowing stage play by Pulitzer Prize-winner Sam Shepard, at MATCH. Tickets start at $10. Showtimes vary. 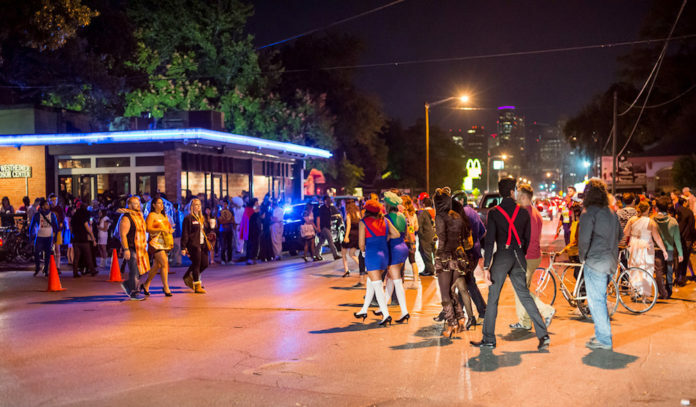 Halloween Events and Parties Around Houston | Through Wednesday, October 31 – Get in the spooky spirit of Halloween at events all month long, from Houston Halloween Fest in The Heights and the Halloween Pub Crawl in Downtown, to the Halloween Classic Car Show and a family-friendly haunted house at the National Museum of Funeral History. Prices, times, and locations vary. Texas Contemporary Art Fair at George R. Brown Convention Center | Thursday, October 4 to Sunday, October 7 – Browse modern artwork from more than 65 exhibitors throughout the seventh edition of the Texas Contemporary Art Fair in George R. Brown Convention Center. Tickets start at $25. Times vary. 39th Annual Festival Chicano at Miller Outdoor Theatre | Thursday, October 4 to Saturday, October 6 | FREE – Immerse yourself in a cultural celebration of all things Chicano music, featuring sub-genres ranging from Tejano and Conjunto to Mariachi and Orchestra, when Miller Outdoor Theatre hosts the 39th Annual Festival Chicano. 7pm nightly. Fashion X Houston at River Oaks District | Thursday, October 4 to Saturday, October 6 – Peep the latest styles as models strut down the runway in Houston’s fashion-forward River Oaks district at the 3rd Annual Fashion X Houston showcase. Expect to see global brands and local names alike, including Chloe Dao, Miles David, and Shusi. Tickets start at $35. 6:30pm daily. The Original Greek Festival at Annunciation Greek Orthodox Cathedral | Thursday, October 4 to Sunday, October 7 – Shout “Opa!” while chowing down on authentic Greek cuisine, watching traditional music and dance performances, and shopping from a variety of vendors at The Original Greek Festival at Annunciation Greek Orthodox Cathedral. $5. Times vary. The 28th Annual Komen Houston Race for the Cure at Sam Houston Park | Saturday, October 6 – Join the Race for the Cure when the Susan G. Komen foundation hosts its 28th annual event at Sam Houston Park. Proceeds from the race will go toward research, care, and community resources to fight breast cancer. $40 for adults; $25 for children 17 and under. 7:45am. Houston Texans vs Dallas Cowboys at NRG Stadium | Sunday, October 7 – Watch the Houston Texans play the Dallas Cowboys on their home turf at NRG. Tickets start at $195, but you may find cheaper or better seats on TicketNetwork’s resale site. 7:20pm. 40th Annual Houston Italian Festival | Thursday, October 11 to Sunday, October 14 – Your carb-filled dreams have come true—spend all weekend long stuffing your face with lasagne, spaghetti, and pizza at the 40th annual Houston Italian Festival. Let your food settle while enjoying film screenings, kids’ cooking classes, Italian language classes, Carranza puppet shows, interactive sidewalk art, pasta-eating contests, grape stomps, and a bocce ball tournament. Admission ranges from free to $8. Times vary. 47th Annual Bayou City Art Festival in Downtown | Saturday, October 13 and Sunday, October 14 – Admire the work of artists from across the country at the 47th annual Bayou City Art Festival in Downtown Houston. The family-friendly festival attracts 20,000 visitors each year and features artwork from more than 300 artists in 19 mediums. $12. 10am to 6pm both days. Bob Dylan and His Band in Concert at Smart Financial Centre | Sunday, October 14 – Don’t miss a performance by the legendary singer-songwriter of such influential songs as “Blowin’ in the Wind”, “I Shall Be Released,” and “Forever Young” when Bob Dylan and His Band take the stage at Smart Financial Centre. Tickets start at $59.50, but you may find better or cheaper seats using the TicketNetwork online marketplace. 8pm. Houston Rockets vs. New Orleans Pelicans at Toyota Center | Wednesday, October 17 – Kick off the Rockets’ 2018 to 2019 season when they hit the court to play against the New Orleans Pelicans at Toyota Center. Tickets start at $25, but you may spot better or cheaper seats using the TicketNetwork online market. 7pm. Patton Oswalt at Revention Music Center | Saturday, October 20 – Burst out laughing when actor, comedian, and writer Patton Oswalt brings his Grammy-nominated stand-up show to Revention Music Center. Tickets start at $39. 8pm. 37th Annual Orange Show Gala at Crowne Plaza NRG | Saturday, October 27 – Contribute to the preservation of Houston’s iconic folk sites and events, including the Orange Show, Beer Can House, and Art Car Parade, as well as the continued development of Smither Park, during the 37th Annual Orange Show Gala at Crowne Plaza NRG. The formal event will feature a performance from Celebrity Allstars Legacy Reunion. Tickets start at $650. 7pm to midnight.